THE NEW EDITION is now available. I hope you will buy directly from me. It is easy here, and I will of course dedicate books as you like. If you want to order multiple copies, with different dedication requests, it remains easiest to buy them, and send them, individually. But if you have any particular queries, then do get in touch via the Contact page. This new edition has been enlarged (32 new / 20% more pages, and over 80 new images), and much has changed. It has been redesigned, and updated throughout, with the central section on Grapes and Their Wines having been substantially rewritten and now, sensibly, in alphabetical order. Completely new are a number of Essays, many on issues pertinent now in a way they were not 20 years ago: Climate Change, Organics, Biodynamics, Natural Winemaking, Closures, Alcohol levels; plus Wine Gadgets, Scores, Carbon Dioxide, Aromas as Complexity, and Comparative Tasting Technique. And there is a sizeable new section on Blind Tasting. The DIY Tastings section has been made more complete, with the addition of preparatory reading suggestions from the book, plus subsequent check-and-reinforce questions; and there is a new, higher level, final tasting on Quality Calibration. Also new, on the site, are specific recommendations for each of the book’s tastings, from Waitrose, and The Wine Society. 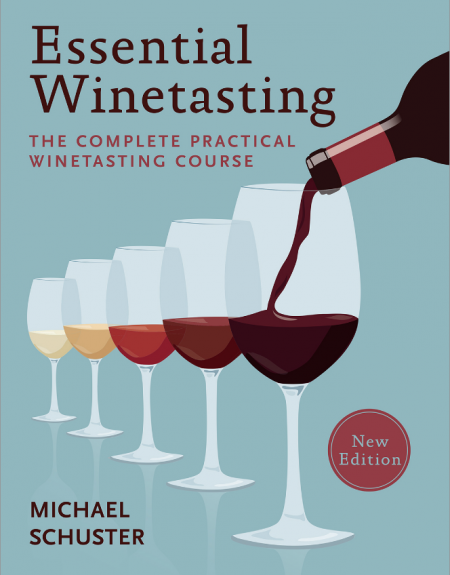 Essential Winetasting is based on my teaching and my courses.The first edition (Mitchell Beazley 2000) won all three major British wine book awards for the Best Drink Book 2000: The Andre Simon, Glenfiddich and the Prix du Champagne Lanson awards – the only occasion on which one book has won all three. It is a unique combination of Teach Yourself Tasting Manual, and Wine Reference Book. It has sections on Tasting (of course! ), Wine Language and Values, Viticulture, Winemaking, Grapes and their Wines, Wine and Food, Wine Maps, and a substantial, carefully designed DIY Tasting Course. In the new edition you can use the Tasting Course in conjunction with ‘Ideal Wines’, from The Wine Society and/or Waitrose, recommended (with direct links) on the website. The book also has a cross reference section on most of the spreads, taking you to other sections of the book for further information / clarification on particular subjects, thus making it a powerful learning tool.